The Saguaro pitchers weren’t a surprise to the Rafters, who paddled them for eight hits over seven innings in an 8-3 win. Tres Barrera, Jake Noll (pictured), and Daniel Johnson were in the starting lineup at C, 1B, and CF respectively. • Barrera went 0-for-3 with a run scored and sac-fly RBI. He committed an error on a pickoff but threw out a baserunner attempting to steal. • Noll homered for the second time this week, another three-run shot while going 2-for-4 overall. After a 1-for-16 start in his first four games, he’s 6-for-20 in his last five. • Johnson had his fifth hitless game but had an outfield assist on a lineout DP to erase a leadoff walk. Luis Reyes did not pitch again, so start the speculation that he’s hurt; confirmation expected from the Nationals on the 31st of this month. • Taylor Guilbeau was the first Rafter reliever and got the benefit of the Johnson-Noll DP to work around a walk and a hit in scoreless 4th. He struck out two batters. • And apparently it’s rule that Jordan Mills must follow Guilbeau, and he needed just nine pitches to retire three batters while still issuing a walk. The win, combined with a tie between Mesa and Scottsdale, opened up a 3½ game lead for Salt River in the AFL East. 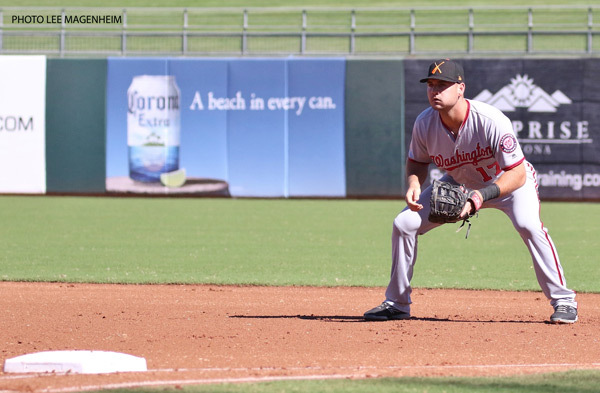 Tonight, Carter Kieboom is penciled in at SS and will bat sixth in tonight’s Fall Stars game. The official list of MiLB free agents has yet to be released and Baseball America appears to be issuing its transaction posts on a bi-weekly basis thus far in the offseason. Minor-League Free Agency began last night at 5 p.m. ET. For about two months, the Syracuse Chiefs were roughly a .500 team and seemed like they just might not finish with the worst record in AAA for the third straight season. They barely avoided doing so, thanks to the Buffalo Bisons losing 11 straight to end the season. But it was the same old story otherwise: injuries limited the playing time of guys who might have otherwise spent significant time in AAA, thought it’s doubtful it would have transformed them into a winning team. Once again, homegrown players were able to be plucked from the roster and plug holes but perhaps at the cost of their development (see: Stevenson, Andrew; Fedde, Erick; Rodriguez, Jefry) while there were a couple of feel-good stories, too – Spencer Kieboom this year, Adrian Sanchez last year. (The jury is still out on Austen Williams and Kyle McGowin). In 2019, the Nationals’ AAA affiliate will be the farthest away from its parent club since 1987, when the White Sox were affiliated with the Hawaii Islanders. It remains to be seen how the big club will handle this, but I suspect that there will be at least two or three players who will be stationed at Harrisburg instead of Fresno (most likely: reliever, catcher, and the backup to Ryan Zimmerman’s backup) to ease the logistical pain of having to fly someone across multiple time zones. Even if they hire a private jet [insert complaints about Lerners here], it will take considerably longer than, say, hopping in car and driving to DC. If you’re interested in seeing the I.L.’s leader in sacrifice flies, click here. Small world. I was on a flight from Phoenix staring @ a name tag on a young woman’s bag . She ended up being the neice to former Ex- po SS/2b Mark G – man . The name tag was of her brother who plays in Blue Jays chain.